10" gray and creme cloth Little Shaver has long golden yarn hair topped by a flower hat tied under her chin and a hand painted face. 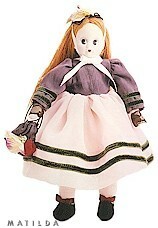 She wears a delightfully simple, homespun dress with a grey bodice. The full, billowing creme skirt is encircled by two gray striped bands above the hem and she wears simple black shoes on her feet and a petticoat trimmed with fine antique lace. Accessories include brown lace gloves and a flower handbag. Retired item - available for limited time.